Alright, I have finally completed the new demo. Although I didn't continue the story any in this update, much of the early game has been tweaked and fleshed out. The most notable changes being the addition of the cave and below ship maps, some secret cutscenes, weapons displaying in battle, being able to loot chests in battle, and the church/advisor menus (Finally got a way to save the game!). Overall, the early game has a lot more exploration and some fun new cutscenes if you try searching for the renewal gem. The full changelog can be found in the spoiler below. +Spells can now tint the cutscene. +Spells now have a unique cast color. +Spell flash can be called at any time. +Freeze levels 1 and 2 now have an animation. +Foregrounds (platforms) in battle cutscenes. +Supports normal promotion, special promotion, and tiered promotions. +Can be accessed in town or if you egress from battle 2. +Arrow keys now increase dialogue speed. +Z button will increase dialogue speed AND auto advance. -Fixed enemys not animating faster when walking. -You can only talk to Jamie once. -Jamie 'leaves' between room changes if you talk to her. -Fixed issue with Moving NPC Objects in cutscenes. -Fixed issue with looting items from chests. -Fixed issue with using items in slot 2 in battle. -Chest in town now contains a medical herb instead of 30 gold. -Added diagonal movement to MoveCharacter script for cutscenes. And here's the new demo. As always, if you encounter any errors, let me know how you managed to break my game. Send me a screenshot of any errors and if possible, hit F5 and send me the savestate that GM creates. (Not to be confused with the ones that the church menu creates). -Quick fix for medical herbs. Certain slots crashed the game and they also only restored 0 HP. These issues are now fixed and the link has been updated. Wow, that's the best way to describe it. Everything looks so nice and fluid and I like the changes to the town meeting. Overall, a really solid alpha release I didn't get a chance to test all the features but I liked all the details I saw when playing. Keep up your dedication to excellence! Yeah lol the town meeting was way too boring initially and felt out of place compared to how the story picks up and flows better later on. I figured I might as well make it a bit more interesting and cut out a bunch of pointless dialogue from it. Glad to know my change worked out for the better. The nature of magic and the Doomskull War won't be talked about too much in this game, but I figured it would make the world feel more alive if the player had some knowledge of them. I might talk more about these events at some point as I have these worked out in detail, but i'll save that for another time. Things are looking great here Chaos! I can see some really exciting fan games coming out of this engine! Keep up the great work. Speaking of the engine, I updated item use today. Essentially what I did is I created a generic Item use script that deals with most item uses (ie, conjuring spell effects). States and such of the generic script can be overwritten by the script of the actual item if you wanted to add, bypass, or change something. Examples include medical herbs (they skip the spell flash and creation of the spell animation), brave apples (they jump to the level up state), and power potions (they run their own custom 'grant this character 2-4 attack states). Spells and Item effects were also combined into a single effects script due to them sharing 99% of the same variables. I also unofficially added status effects and mana restore to spells and items. Basically, they have a space allotted for them, but I haven't fully implemented those yet (probably tomorrow's task). Nonetheless, I'm hoping to finish up items tomorrow and get enemy AI updated so that they too can use items. Should be a fun day tomorrow. Status effects and Mana restore have been added to spells and items. These are stackable which means that a single spell or item can heal, restore mana, and cure all status ailments at the same time. I also updated the item use menu to allow for egressing from battle (ie, the angel wing). Oh right, and we have these new items as well. The antidote and fairy powder can be used to cure status ailments outside of battle. The power potion can now be used during battle. Finally got around to adding the targeting of all characters (ie aura 4). This means that we now also have the last 2 items implemented as well. (Healing Rain and Light of Hope). That's quite the update! Nice job Chaos! Enemy AI has been updated to include healing items. If they can use the item this turn and their best target (the guy with the lowest % of HP remaining) has at least 25% of their health missing, they will use it to heal said target. I also fixed a number of smaller issues with AI. First off, enemies were following the shortest path as opposed to the least cost path. In other words, they were trying to cut through forests as opposed to taking the longer (but faster) way along the roads. The next thing that has been fixed is that groups of enemies had a tendency to form a single file line when moving towards their target. Not only was this kinda stupid looking, but it caused certain units to fall far behind the rest of the group. Now they will keep pace with the leader of the pack which means you can no longer pick them off one at a time. And the final thing is that the 'threat / priority' functions have been tweaked as well. This should stop them from attacking their target from a different side each turn. Edit: Enemies can now use offensive items (Shining Ball, ect) as well. Edit: Enemy offensive magic AI has been fixed and enemies now have a heal spell AI. So in other words, Enemy magic is fully implemented. Edit: Okay so. I overhauled the room transition stuff. It's now a lot cleaner and easier to add room transitions. Oh and we now have the transition that plays when walking to the edge of the map. (Panning one room into another). That being said, just a little more touch up work and the 1.5 update will finally be complete. Looking forward to the next update. Would love to see a new video showcasing all the great stuff you are doing. I thought of a couple things that might be nice options for people when making their games. The option to have excess experience on leveling up either carry over or be zeroed out. I believe various shining games have handled this differently. The option to have your hp/mp actively increase when leveling up. What I mean is in shining games you level up and you hp increase by 2 hp you don't actually get that right away. It might be a nice option to have that be usuable hp or mp right away. I am thinking moreso early on when that extra heal spell might be needed. Well apparently my last post didn't go through when I hit submit, so let's try this again. Carry over EXP and HP/MP increase have been added to global game settings script. And here's a quick update video showing off items and magic as well as the enemy AI when using such things. Down to 2 major features now (Barring anything I forgot and any other minor 1-off quirks found in the SF games). Factions (also encompasses muddle, control units, and general character code re-work) and Shops. Shops are a 1-off that doesn't really effect the rest of the code on a global scale like the character code rework does to that shouldn't take too long. Overall, I can't wait to share the rest of the story with you guys. It's been painful for me to try not to spoil anything, but fortunately, I'll be able to start working solely on story related stuff soon. I do want to do one last re-code of the engine at some point to clean everything up and tie up any loose ends, but I think I'll hold off until I finish the game first (Really this depends on how many road blocks I run into with the factions implementation). I'm way too excited to finally share the story to come. 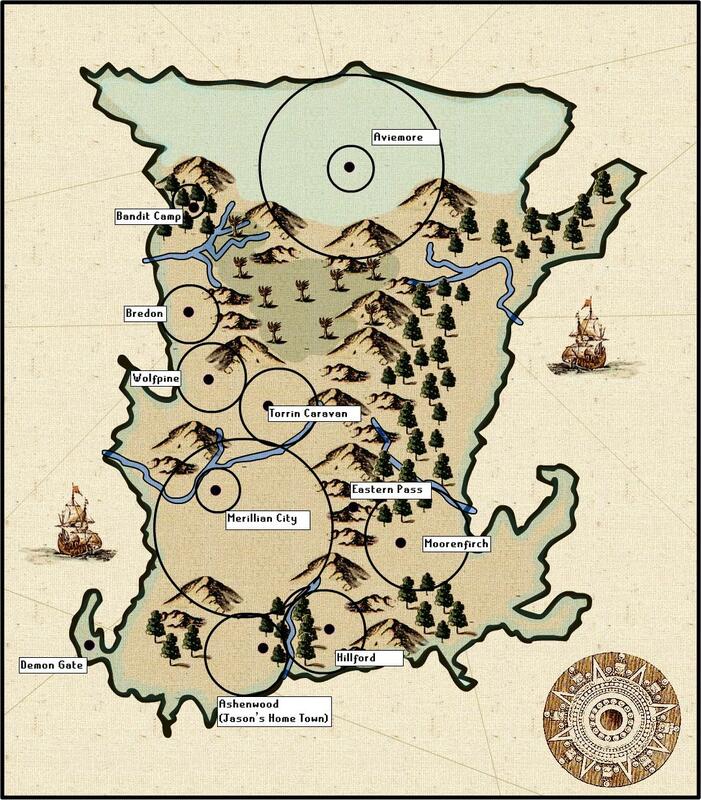 Most of the game takes place on Athalen, however the prologue / backstory of everything takes place on their home continent of Verdius. I figured you guys might like to know where these characters came from so I present to you, The Continent of Verdius. I need to try viewing on another device cause no videos show on my iPhone. I'm excited to see he updates though. I cannot recall if it was added already but do you have the ability for the SF3 battle where the team split up and the main team had 1 task while the remaining members had another task? I always hated that battle since I didn't level up my bench but the ability to recreate would be nice for some I imagine. Caedmonball19 wrote: I cannot recall if it was added already but do you have the ability for the SF3 battle where the team split up and the main team had 1 task while the remaining members had another task? It depends on what you want to do. I'm not too familiar with SF3, but the battle you mentioned has been brought to my attention a few times. From what I understand, this battle has those in your active battle party face off against one group of enemies, and your reserve members face off against another. In short, main group spawns in one area, reserves spawn in another. As of right now, I don't have anything that can check the reserves list, however one could theoretically copy paste the main group one and change it so that it looks at reserves. I'll add it to the to-do list for 1.6. This also reminds me of SFCD book 2 where the team is split up and you actually have 2 different teams which are determined by the game. Although you can force certain characters to appear in battle, it doesn't support 2 split teams in town yet. It's a planned feature for down the line. Started working on fixing up the character code. It's one of the first things I added to the game, so cleaning it up has been long overdue. When it's done, it will have support for multiple factions, AI overrides, controlling all units, and a bunch of other minor things. I'm hoping to finish this before I leave for vacation (this Friday) but it's a huge undertaking so I have no idea how long this is going to take. I managed to implement Factions as well as controlling enemy units. I still have some touch up work to do with it, and a lot more testing, but so far, it looks like everything works. That is looking great! Can't wait for the next demo to come out. I would be happy to test when you are ready. looks like this is getting better and better. on a separate note i ended up having to find your youtube channel for the videos because they aren't showing up for me here. Would the complete version possibly be added to Steam? Any updates Chaos? seems like you are in the home stretch. Yes I have updates lol. I've been trying to record a video for 2 weeks now but I kept getting interrupted mid recording forcing me to start over XD. But either way, I finally managed to get it done early this morning (and if I sound tired during the video, that's why lol). And here's the direct link in case the browser blocks the embedded video. Anyways, character code has been completely re-done. Now overriding events is much easier. Want to control enemy units? Want your characters to make their own decisions and have the game play itself? Well, both are possible now lol. Also, support for factions has been added. You can create as many factions as you want. Each faction has 2 lists 'allies' and 'enemies.' Simply toss the other factions onto those lists and targeting and their AI will change accordingly. Basically, if the player is allies with Faction A, the player will be able to give items to, and heal that faction. If the player is enemies with Faction A, they cant heal or trade, but they can attack them. One way relationships also work, so if you wanted a group to attack the player but have the player unable to fight back, that's possible. The next demo I release will likely contain the entirety of Chapter 1. That being said, I'll be working more on script writing, art, map design, and all that stuff for a while. I've got most of the next cutscene done, I just need to end a fight / argument and add finish adding the optional Jamie stuff if you convince her to come with. I also updated Jason's portrait so he is no longer 'Blue Bowie.' Max and Ciera will be receiving updated portraits too. Kira will get hers once I decide on which rout I want to take for her character. Wow looking great! This new update will be great for those people wanting to make SF3 like scenarios where different units came into the battle. Should make for some fun storylines. Can't wait for the next demo to come out. Chaos are you still planning on making the sprite size an editable feature? As I start pondering my own game I am wondering if I can use sprites I've already made or if I need to create new ones. I wasn't sure what this did your engine by changing sprite sizes. Sprite size is already changeable since it's only the collision masks that matter. 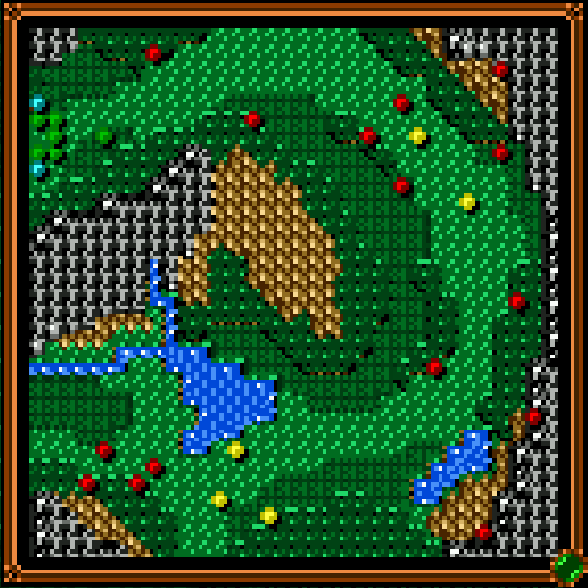 In other words, a character like Zeon is much larger than 24 x 24, but he is still only bound to a single 24 x 24 tile. Now as far as changing the actual tile size goes, yes I want to make that a changeable setting eventually, but as of right now it's all hardcoded. It's really just a simple matter of changing every instance of (24) in the code to some global variable, though that might take a while as it appears pretty much everywhere in my codebase lol. Anyways, I finished writing the dialogue for the next cutscene. I don't think it's too long, but it IS the longest cutscene yet. Nonetheless, there is 7 dialogue scripts I need to write for if you decide to talk to your team members before starting battle 3, 3 cutscenes (2 hopefully short ones, and one that might end up being as long as this one), and 3 battles to go before I finish all of chapter 1. Edit: Ciera's portrait has been updated. She is no longer orange Mayfair. Updating Max is the next task. Edit: The new character portraits are in! Edit: Huge optimization to AI. I removed the need for the fluff code so it should be easier to read. Now all you need to do to set up AI is to create a list of things you want your AI to try in the order you want it to try it in. For example, Most characters would try to attack a target in their range, if there are no targets in their range, then walk towards the closest target. Use Medical Herb //try using medical herb (if you have it), if you have 0 targets OR no one really needs healing, try the next thing on the list. Cast Heal Spell //Try casting heal (if you have the MP for it) if you have 0 targets OR no one really needs healing, try the next thing on the list. There is also support for multiple different threat functions when selecting a target. There are 2 more arguments to further enhance AI crafting, 'minimum distance' which says "if my target is more than x spaces away, then this function will fail (in the case of pathing to characters outside of attack range)" and "minimum threat" which is simply "if my possible heal / heal item targets are missing less than X% of their health, they don't need healing"
Edit: I finished the rough sketch of the terrain for the next 4 battles of chapter 1 as well as another corner piece to finish off the coastline of the area. This means 5 maps in total. I decided to add an extra battle as it seemed to fit better mapwise. Edit: The road to chapter 1 continues. The overworld tileset is now complete (unless there's some random piece I'm missing. I wont know until I need it lol.). As far as the next 5 maps go, all are roughly tiled out in the room editor. The first is completely done and the second is mostly done. And since I'm such a nice guy, I'll give you a sneak peak of the next 4 battles. It's really hard to NOT work on chapter 2's maps right now and the unfinished parts of the grid are driving me crazy. Oh well, chapter 1 comes first! Edit: After 3 days of pounding my head into a wall, I finally managed to come up with a design I'm happy with for Valdrfjell. I feel like it's a little bit on the large side taking up 4 maps in total, but overall, I like the design. 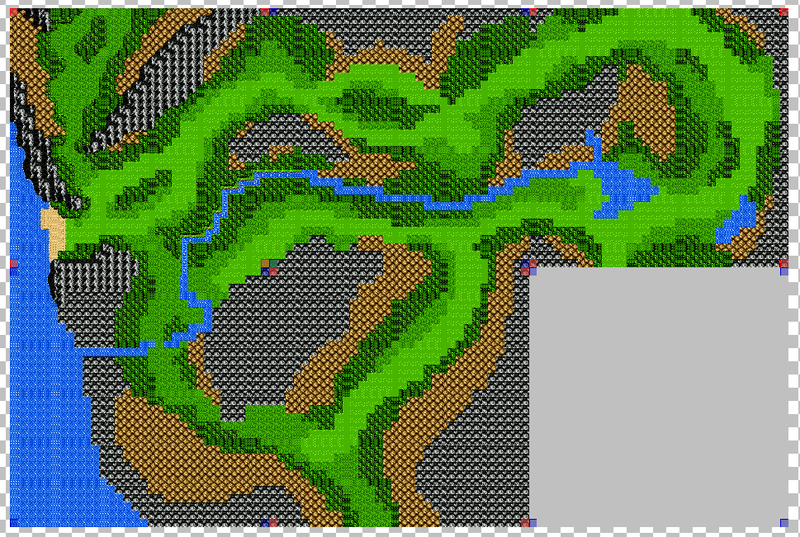 The next step is to fancify the rough outline, make the tileset, and move the maps to my main project. Edit: Battles 3 and 4 are officially done and the main town area is finished. Down to battles 5, 6, cutscenes, and new character portraits now. Edit: Battle 5 is done! Only one more battle to go and the combat side of the demo is done. Edit: All battles are complete and in working order. I'm currently working on playing my way through the game and adding the post battle cutscenes / linking up the various maps (SF2 exploration style). It's rather tedious, but hopefully I'll have this next demo out before the end of the month. Lol thanks man, I appreciate it. I've been quite busy this last week and haven't had too much time to work on this project so progress has been slower than I'd like. Anyways I ended up re-doing battles 4 and 5 to make them flow a bit better and to make them slightly more challenging. Battle 5 may be a little too difficult, but eh, I'll let you guys decide on that during the next demo. I'm currently working on the two small cutscenes between battles 5 and 6, and will re-balance battle 6 after that. Then the task of completing the final nightmare of a cutscene to chapter 1 begins... I hope you're happy with the way I've chosen to end chapter 1! I don't really consider this a spoiler but some of you might. This is the minimap image of battle 5. All battles are now balanced and all the cutscenes that surround them are complete. Now it's down to 5 character portraits / overworld sprites, filling the town with NPCs, and the final cutscene. Today was a productive day. Town is now linked with the overworld / battle maps. I started work on fleshing out the town with searchables and NPCs, however the NPC's don't have any dialogue yet. I also added 8 '1 way door' objects to the game which I needed for ledges. And the final thing that was added today was the GameMaster cheat to the options menu. Essentially it allows you to control every unit on the map. I may make it so that it only becomes available if you have a save file from the end of the demo, but I'm not sure yet.